If if morethan one person lives in your household, you will have disagreements. If more than one child lives your household, you’ll have quite a few disagreements. If more than one young child lives in your household, some days will feel like allyou have is disagreements. That’s because the people in your household are sinners, and little children are little sinners who need lots of instruction. 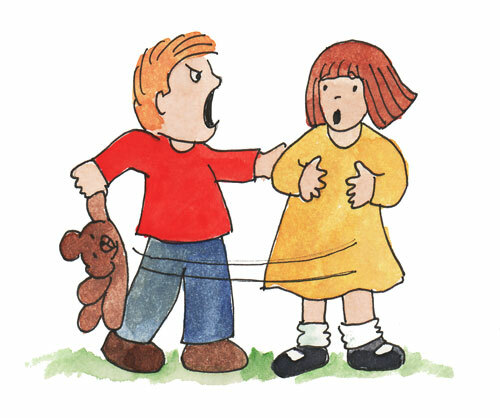 One simple way to help a child learn to end an argument is to train him to answer softly. Memorize Proverbs 15:1 with him. Talk about the verse together. What happens when we answer softly? What happens when we respond with harsh words? Talk about specific times when he has responded kindly and when he has responded harshly. Which was better? Talk about Jesus and the soft answers He gave when being wronged. Remind your child that Jesus loved him so much that He was even willing to die rather than fight back against those who wanted to kill Him. Jesus’ death (and resurrection) are what gives him the strength to be kind, too. Jesus will help him. Role play and coach him through imaginary disagreements. What can he say if his little brother grabs his toy and starts screaming? Do this during a rational, peaceful moment instead of waiting until the fight is in progress. Help him prepare for the inevitable. If he’s old enough, have him draw a picture of himself and a sibling, add some dialogue bubbles and have him dictate what he should say when wronged, while you write it down for him. Post his picture in a prominent place. Start the day praying together for the strength to answer softly when wronged. When you overhear him responding on his own with a soft answer, encourage him and stop to thank God for helping him answer in a God-pleasing way. Or talk about his response later in the day, offering encouragement and thanking God for His grace. And don’t forget to set a good example for your child! Pray for the grace to answer him softly when you would rather be impatient and harsh, and show him how to respond graciously by the way you speak to others.